Lightly season the roast with a little sea salt and ground black pepper. Heat the oil in a large flat skillet over medium-high heat. Brown the roast in skillet for 3 minutes each side. Remove roast to cutting board. Add the onion, leeks and garlic to the skillet and saute for 1 minute. Remove from heat and set aside. In a small bowl, combine the spices (ground sage through ground allspice). Rub the spice mixture evenly over both sides of the roast and then season with the salt and pepper. Place carrot, celery and fresh thyme sprig in the bottom of a large slow cooker. Place the roast on top of vegetables in the slow cooker (cut in half if it does not fit properly and situate in one layer if possible). Add in the onion mixture, placing half with vegetables at bottom of slow cooker and the other half on top of the seasoned roast. Carefully pour the beef broth around the roast. Cover and cook on LOW for 4 ½ hours. Remove roast to cutting board and let settle for 5 minutes. Slice roast into thin slices. While roast settles, cut rolls in half lengthwise and heat them at 350 degrees on a baking sheet for about 5 minutes or until crisp. Remove from oven. To assemble sandwiches: place some of the juice from the slow cooker (its ok if veggies get in it) in a shallow bowl that you can dip the rolls in. 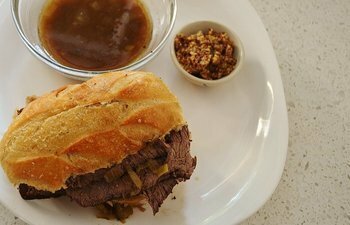 Dip the bottom of each roll in the sauce and top with some of the beef; dip the cut side of each roll top in the sauce and place on each sandwich. Serve with the hot mustard and a small bowl of au jus for each person to dip, if desired (I highly recommend). If you have time, remove the vegetables and broth to a saucepan (after you have removed the meat to a cutting board to cut into slices; keep beef covered to keep warm). Bring the liquid and veggies to a boil, reduce heat and simmer for about 15-20 minutes which will concentrate the liquid. Top the beef with the veggies and use the concentrated broth as your dipping sauce. If you do not have fresh thyme and/or leeks these ingredients can be left out and it’ll still be delicious. Philippe the Original (more often referred to simply as Philippe's) is widely credited as the birthplace of the French Dipped sandwich. Legend has it that the original owner Philippe Mathieu accidentally dropped the bread for a sandwich into a pan of juices and his customer (possibly a police officer with the last name French) was happy to eat the sandwich on the flavorful, soaked bread.